Are they insured? Do they have their own insurance covering the work site and workers during the construction? Are they licensed? Get their license number and check with the state license board to validate it. 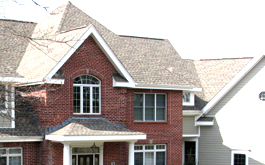 Do you plan to roof over existing shingles? Ask the contractor whether he recommends tearing off the existing shingles or putting a new roof over them. A tear-off will allow a proper inspection of the sheathing, expose any problems, and provide a smooth surface that is easier to waterproof. But roofing over existing shingles is less expensive. Will you replace roof vents and flashing? It is a good idea to replace these to ensure a leak proof roof. Discuss the cost and completion ahead of time. Is there a warranty and guarantee? Ask for both, which ensures that the manufacturer guarantees the materials for defects and the roofer backs the work for 10 years. When will you begin and end the job? Make sure your roofer plans to stay until the job is done. Often, contractors may subcontract the work to other crews. Make sure your contractor is there to inspect the progress and quality of the work. Do they have customer recommendations? Ask for references. Make sure the contractor is willing to provide you with references.